I mean, what else does a Reading Specialist//former Kindergarten teacher's daughter name a post where she's wearing pink everything?! If you have kids/nieces/etc. or are a teacher.. or just have any exposure to children's books - Pinkalicious is a book about a little girl who loves pink everything! It's a cute one, a personal favorite since I can relate (aside from Chicka Chicka Boom Boom!). 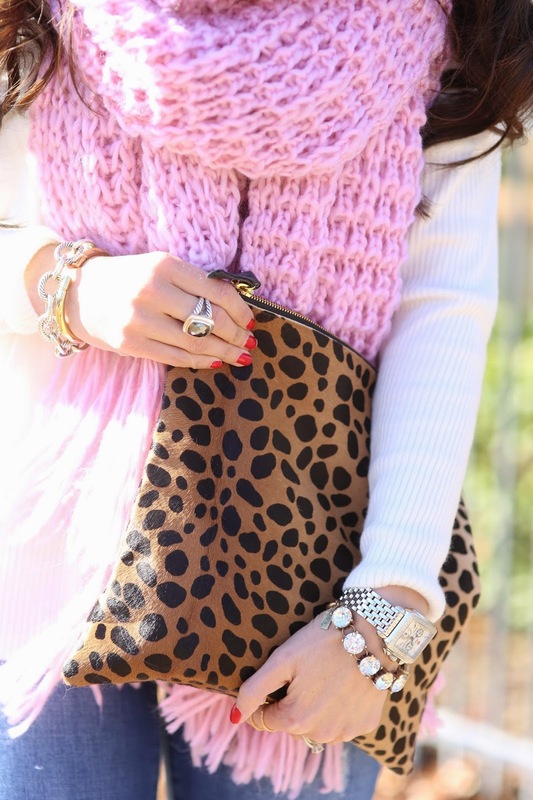 On the other hand, I highly recommend this chunky, massive, cozy & soft scarf from Nasty Gal! It's definitely functional for staying warm - but I think it makes an even better accessory. :) By the way, Fitz has agrees - he thinks it makes a great toy..
PS. PIPERLIME IS running a 25% off site wide sale today! My leopard Clare V clutch is part of the sale! AND! Shopbop is running 20% off their sale items.